Okay, so I have a legitimate question for everyone reading this article: Is there anything better than baby snuggles? The simple act of a baby sleeping soundly on your chest is, I’m convinced, the answer to world peace. The world would be a much better place if everyone could just walk around with a sweet, sleeping, babe attached to the front of their bodies. I’m sure of it. That’s why I’m such a big advocate of baby wearing. I’m obsessed with it. The benefits for everyone involved (which I’ll get into later on) are innumerable and, when you find the best baby carrier for your situation and body, it’s truly the most practical thing you can do with a newborn. First of all, if you’ve ever had a newborn (pay attention, expectant moms), you know that, suddenly, you’ll come down with a horrible disease called Not Enough Arms. It doesn’t matter if you’re a first time mom or a sixth time mom, there are too many things to do (laundry) and too many babies (even if you just have the one) to handle it all. Women are strong. We get it done. But, that doesn’t mean it has to be hard. For this very reason, babywearing is seriously one of the best things you can do. All it takes to successfully babywear is some fabric (we’ll dive into what kinds are the absolute best in a little bit) a baby, and a body. I mean, if you have shoulders and a torso, you’re good. Seriously. You don’t even need the rest of the body. The fabric, the baby, and the body make the perfect concoction for world peace. There it is. I claim it. Okay, okay, maybe I’m reaching. But the fabric, the baby, and the body do make the perfect concoction for clean clothes, clean floors, and dinner cooked. So, basically the same thing. This ability to get through your daily responsibilities is super important for second (and third…fourth…tenth) time moms. I’m currently pregnant with my second baby and, when I found out we were expecting, I was really freaked out about all of the stuff that I have to do on a daily basis to keep my first kid (and myself…and my husband…and my animals) alive. How was I going to do all of the stuff with a BABY? Um, HELLO! I would just wear the baby! I’m not due for a couple of months, but I already have my baby carrier stash stocked up. I’m really excited to tell you my favorite carriers to use, because I labeled myself baby carrier obsessed when I had my daughter, but first I want to talk about some of the other benefits of babywearing. We’ve covered the practical reasons, but let’s talk about the emotional, mental, and physical reasons. Like I said before, the benefits are innumerable. It’s actually astounding, ya’ll. Sometimes you’ll get a baby that doesn’t like to be confined to a carrier but, generally, worn babies cry less. When you’re a new mom, a content baby is everything. I am not exaggerating. If you haven’t had a baby yet, you’ll see what I mean soon enough. The most simple reason behind a baby crying less is because they want to be close to you (obviously). Think about it this way: you just provided your baby with the warmest, safest, environment for the better part of a year. They spent that time connected to you in a way that no one else will be able to consciously experience. They know every part of you. Your smell is their favorite smell. Your sound is their favorite sound. You are what they know. So, it only makes sense that they are the most content when they’re as close to you as possible. By wearing your baby close, you’re fulfilling their most biological need: comfort. For every father that immediately bonds with their babies as soon as they come out of the womb, there is a father that, well, doesn’t. Totally normal but probably a little disconcerting, huh? The baby doesn’t do much those first few months and so some new daddies don’t feel like they can do anything with them. If mama is exclusively breastfeeding, dad’s responsiblities are truly just limited to diaper changing and holding baby for 45 seconds while mom shoves some food down her throat. Enter BABYWEARING!! Strap that baby to that daddy’s chest and see how well the bonding process goes for them! Here’s a tip, mama, use that time to SHOWER!!!! Dad and baby will be in blissful bonding heaven. Like I said, it would be hard not to bond with someone literally attached to you. No? Bonding with your baby doesn’t do it for you? What about making your baby super smart?? Environmental experiences stimulate nerves to branch out and connect with other nerves, which helps the brain grow and develop. The benefits of babywearing are that it helps the infant’s developing brain make the right connections. Because baby is intimately involved in the mother and father’s world, she is exposed to, and participates in, the environmental stimuli that mother selects and is protected from those stimuli that bombard or overload her developing nervous system. She so intimately participates in what mother is doing that her developing brain stores a myriad of experiences, called patterns of behavior. So, there you have it mamas (and papas…and anyone else reading this). Babywearing is the best. There are simply no ifs, ands, or buts about it. With that being said, let’s move on to the fun part: SHOPPING! Using my own personal experience, testimonials of other mothers, and good old-fashioned internet research, I’ve compiled a list of the best of the best baby carriers! Are you excited? Me, too!! There are multiple kinds of baby carriers so I’ve categorized the three major types and will include different products for each category. The categories are: Slings, Wraps, and Structured. Let’s begin! Baby carriers, in general, don’t take up a lot of space (another benefit of babywearing vs a stroller that takes up all available space that you have). However, I find that slings are the most space saving because, really, they’re just one piece of fabric. Yes, wraps are also one piece of fabric (never fear, we’ll get into the wraps a little later on), the wrap must wrap (obvious?) around many different body types and tends to be very long. The sling is the most storage friendly of the group because the fabric doesn’t tend to be nearly as long. Slings are like a strange sort of body belt. It goes around one side of your torso, up your back, and then ties onto your shoulder. After that, you just plop your baby in and do your deed (or dishes). 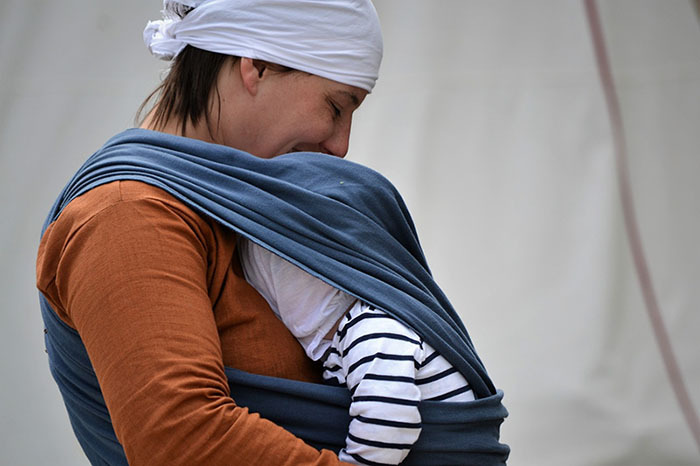 The best thing about slings is that they can be used from day one, while other carriers have a minimum weight requirement or need a newborn insert to use. The first ring sling I ever used was from Sakura Bloom. I haven’t, personally, used a ring sling from a different brand because this one was made so beautifully and fulfilled all of my needs. I was lucky enough to find a new one in a consignment shop because these babies tend to go for between $80 and $350. I know, I know, it seems pricey so don’t hate me! You can plop your kid down in these well into toddlerhood, though, so I think it’s worth it! Sakura Bloom is manufactured right out of California and is a favorite among moms everywhere. Here’s one for great price! On the other end of the ring sling spectrum (the much more budget friendly end) I found this sling on Amazon for a quarter of the price of the cheapest Sakura Bloom sling. That’s big, guys. It has 4 out of 5 stars, which is pretty good considering it’s from a brand that I’ve never heard of before! The best part about this sling is that it’s mesh and breathable, which is perfect for summertime baby wearing. You can also wear it INTO the water! What?? Yep! That’s pretty darn awesome, if you ask me!!!! 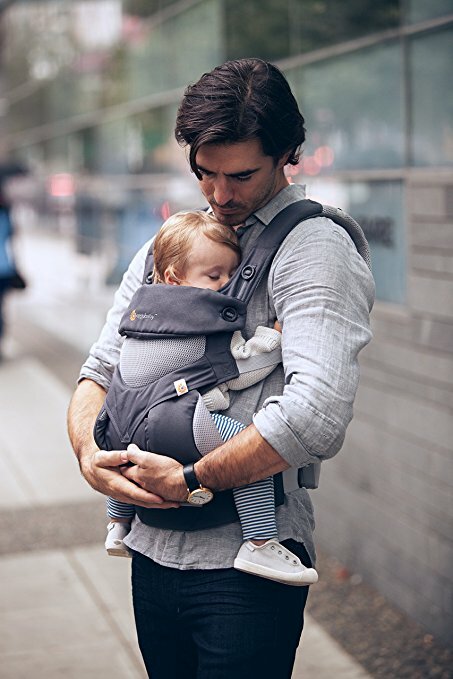 While wraps are certainly not the most secure form of baby wearing (since it relies heavily on the strength of the knot that you’ve tied yourself), it is one of the most effective babywearing methods. Simply put, a wrap is a (rather annoyingly long) piece of fabric that you, well, wrap around your body. With anything, practice makes perfect, but wraps are notoriously annoying to maneuver for the first couple of times. Because they give off an annoying first impression, many people don’t even consider them as an option. Don’t. They’re awesome. Wraps bring your baby, literally, as close as possible to your body which makes them optimum baby soothing material. A win in my book since, if you remember, a content baby is a happy mama! The Baby K’tan. Oh my goodness, ya’ll, I cannot tell you how in love I am with this wrap. Simply because it is the most simple wrap that I have ever seen. It is already put together, no crazy maneuvering that takes fourteen hands and a whole lot of patience, so that all you have to do is slip it on to your body and voila! I used this for months with my daughter before I found the Sakura Bloom sling and it was the best money I’ve spent so far. The good part is that you can buy them from anywhere that sells baby wraps including Amazon and you can order from there if for no other reason than that blissful free, free, shipping (heads up! Amazon Prime offers discounts to pregnant mamas!). The second wrap I’ve decided to list is the Moby wrap. The Moby wrap is easily one of the most popular brands of wraps out there. They don’t break the bank and they’re found everywhere that sells baby wraps! Here’s a pretty green one that I found on my internet research journey. The cost is well worth it! Seriously, though, don’t reject it based on your initial impression. Keep it, try it out a few times, and then decide. It could be the best option for you after a while! So, the final category of baby carriers is what we call the soft structured carriers. They depend on clasps, buckles, etc, to connect to each other to give you maximum support. A lot of people prefer these because of that added bit of security that actual buckles and snaps and clasps bring. 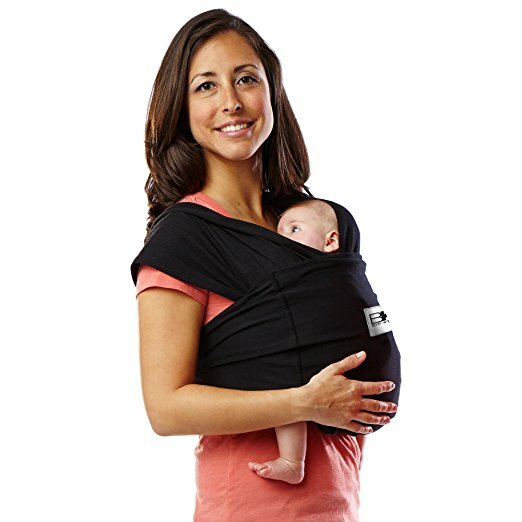 The only real downfalls of structured carriers (that I can see) are that: a lot need extra parts for newborns (or just flat out require a minimum weight of an infant) in order to be used and you have to be picky because some don’t offer the correct ergonomic support for baby’s hip development. Like all of the carriers I’ve listed before, there are usually two ends of the price spectrum when it comes to structured carriers. The first one I’m listing is definitely one of the priciest carriers out there. However, you can’t beat the cold hard truth: you get what you pay for. The higher price makes for higher quality and you can’t just ignore that, right? Ergobaby is easily one of the most renowned brand of carriers, but they come with a hefty(ish) price of $120 and over. If you’re not too concerned with the price, you can get them (again) from literally anywhere that sells baby carriers. Journey here to get your Ergo! You’ll find that there are an incredible amount of soft structured carriers available to you. A simple search on Amazon brings hundreds of options. Another great choice is what is called a Mei Tai carrier. This carrier combines the best parts of a structured carrier and a wrap to make a comfortable, yet structured, carrier. The price is right on Amazon (Prime, holla!) so you really can’t beat it. There are many brands but the one I linked you to is Infantino, a great option for those in need of budget-friendly option! When all is said and done, the best baby carrier for you is truly dependent on what works best for you. There are so many different types, brands, and options out there that it might take a few trial and errors to find the perfect match for you and your baby. Take your time and try them all! You’ll be glad you did! Babywearing is incredible and it can open so many doors for productivity and closeness with your sweet little babe! !